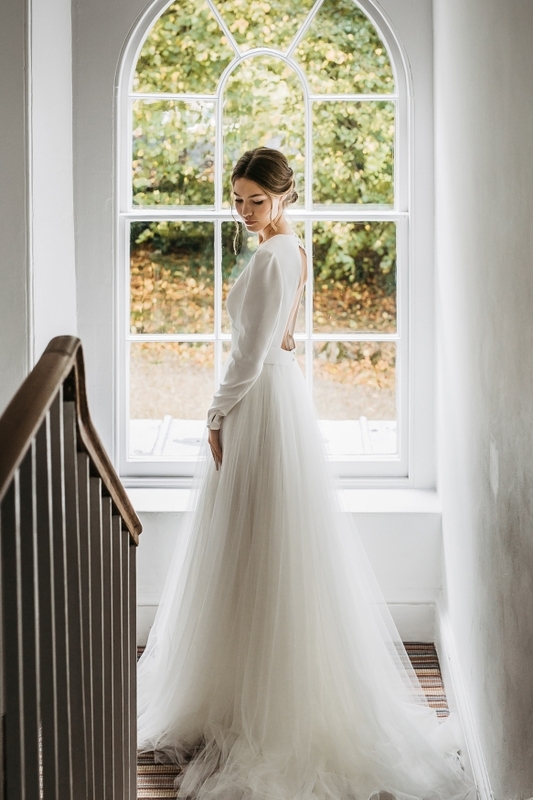 Large-scale weddings – from festival weekenders to luxe country house extravaganzas – are big news in wedding world right now. But, at the other end of the scale, the intimate do is having a quiet moment of its own. 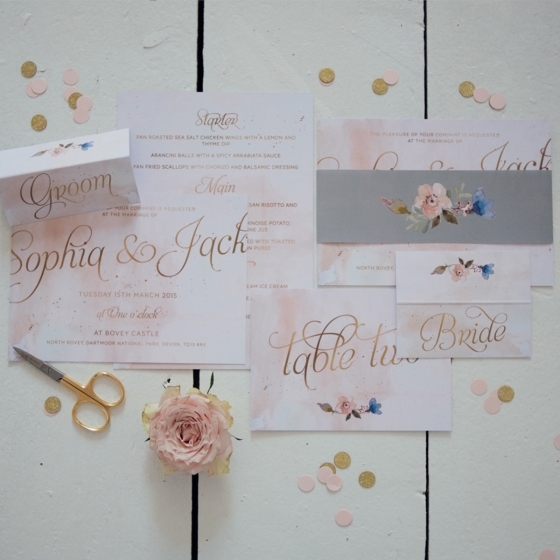 While poring over Pinterest, ticking off tasks on the to-do list and making paper pom-poms into the night are part of the whole wonderful wedding experience for many couples, there’s a rising movement amongst others to simplify the process and steal away to exchange vows in privacy. 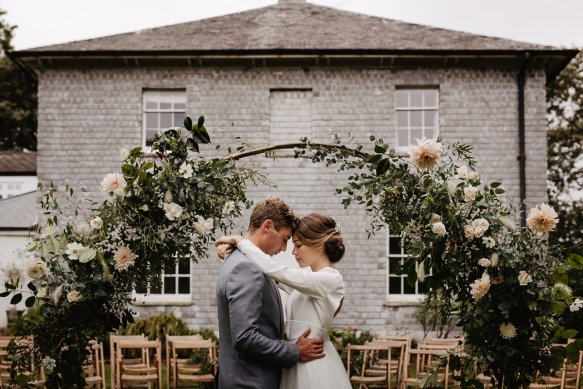 Here, three couples share the stories of their small – yet oh-so special – weddings. 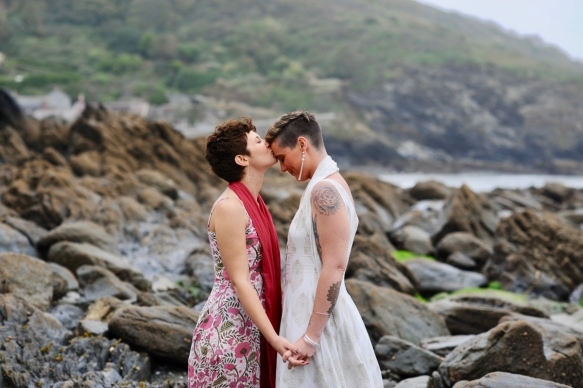 “We chose to elope for a long list of reasons, including the financial costs of bigger weddings and some issues with disapproving family members. But essentially we found that whenever we were trying to entertain the idea of a bigger wedding, we were making decisions that weren’t for us. 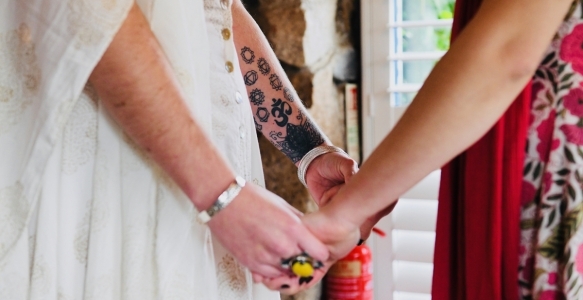 The wedding was no longer about our commitment to one another but became about pleasing other people. 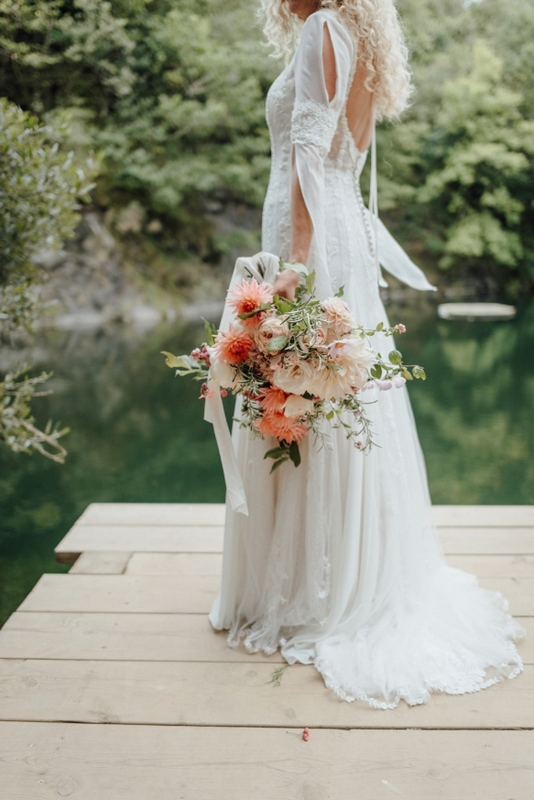 We’re quite unique in some senses because we didn’t want traditional dresses, we wanted to be barefoot and in nature, and we wanted it to have an Eastern vibe. All of those things simply didn’t fit with pleasing other people. We wanted to ensure that the day was about us and our love for one another as opposed to spending the day entertaining other people. On the day, we took our time getting ready together. We had a lovely vegan full English breakfast, drank coffee and laughed! 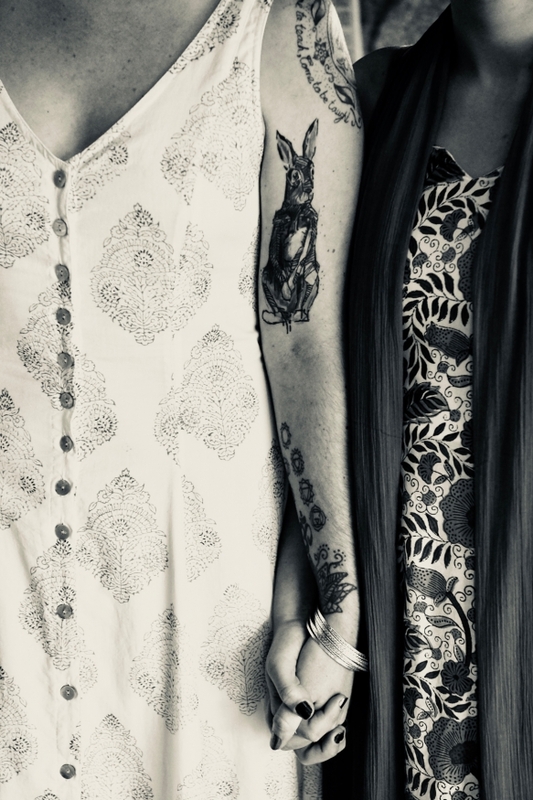 Our dresses were handmade in India – a special place for us and our time there really made the foundation of our relationship what it is today. We wanted to reflect the simplicity and the beauty of India in our clothing. The actual ceremony was really quick, but it was beautiful. Sliding the ring on each other’s fingers and holding it there for a moment while we acknowledged that this officially means we are team was a real standout moment. It was a wonderful moment to acknowledge that ‘this is my person’. 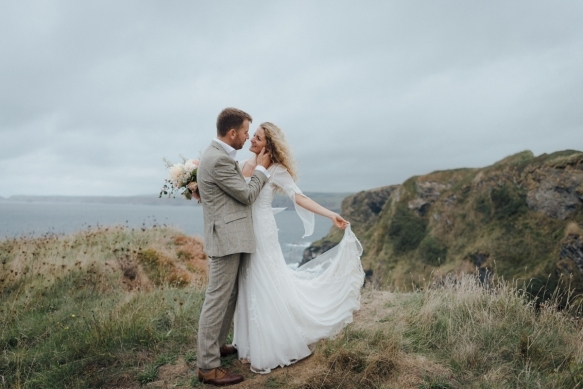 It was drizzling lightly and as our bare feet touched the cold concrete while we walked towards the Wed Shed, we felt completely present in where we were and what this meant to us. We spent the rest of the afternoon being photographed at the venue, a local village and the beach. We had so much fun running around the beach barefoot, then we sat by the fire and drank champagne, listening to old vinyl records, while we waited for our wonderful roasted butternut squash. After dinner, we decided to ditch the champagne and have some cake – a beautiful vegan jam sponge cake – and get the kettle on! We had bought each other meaningful gifts that we exchanged by the roaring fireplace sipping on herbal tea. Before we retired, we spent half an hour looking up at the sky in the hot tub. It was perfect. 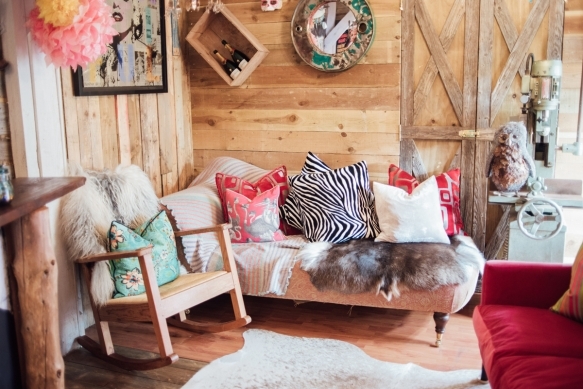 It couldn’t have been more suited to us – it was exactly what we wanted. 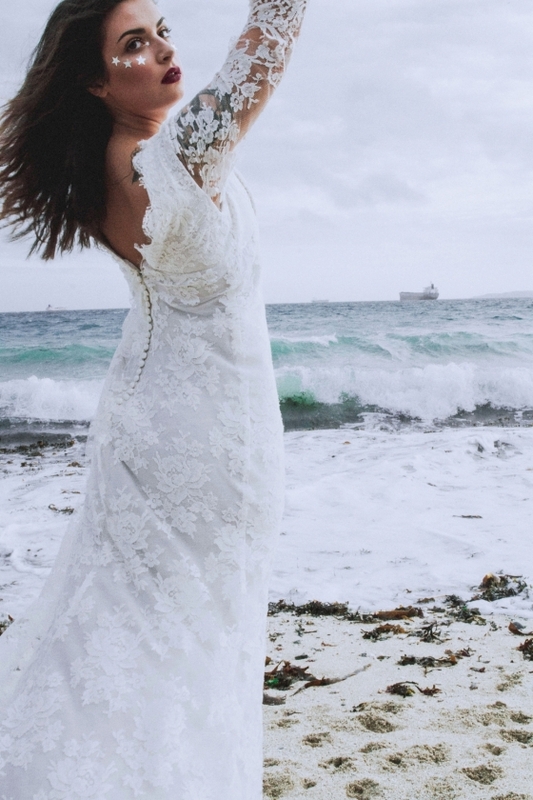 An elopement is perfect if you really want to focus on yourselves. 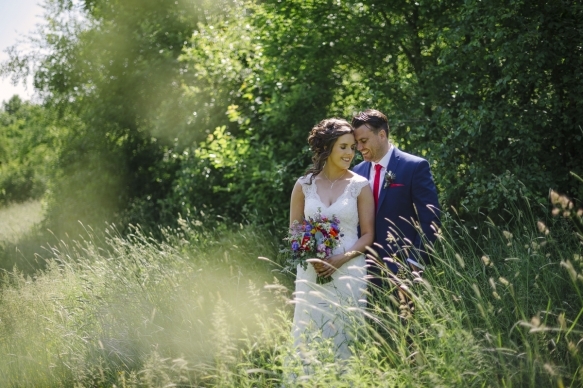 Our rule was: ‘If it adds stress to the wedding, we don’t do it!’ There is often a lot of pressure for it to be the perfect day, and it is important to remain strong in knowing what you want and ensuring the day reflects you as a couple – this is so much easier when it’s just the two of you. 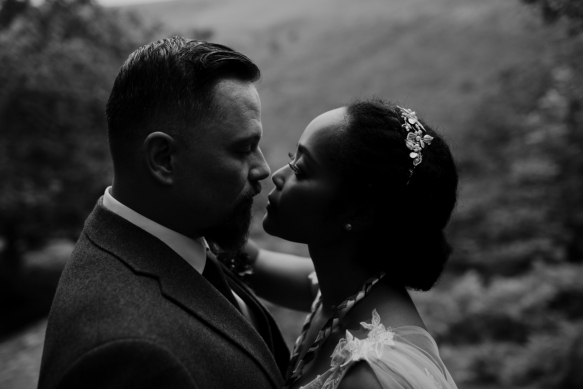 “We chose to elope as we couldn’t invite everyone we love, so after some soul-searching, we decided an intimate celebration was much more our thing. 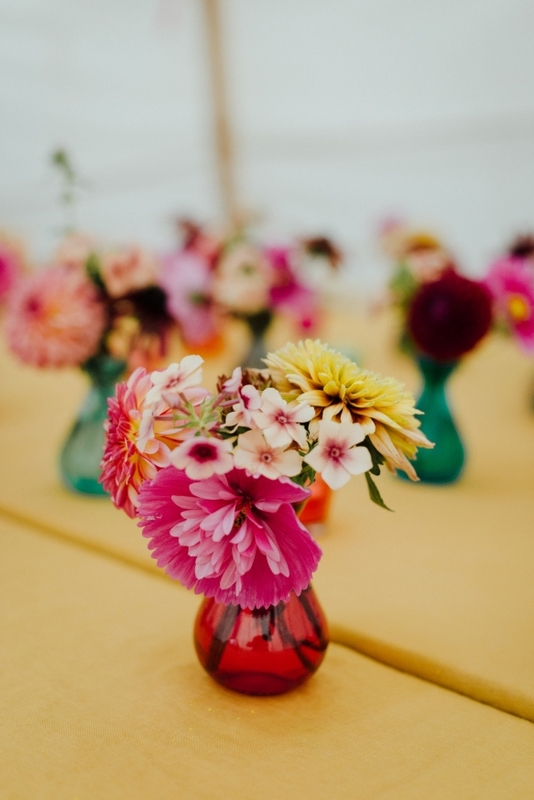 I’m a wedding florist and whilst I adore working on big events, I know the stress that can sometimes be involved in the organisation! We wanted a relatively stress-free day that allowed us to enjoy every moment. 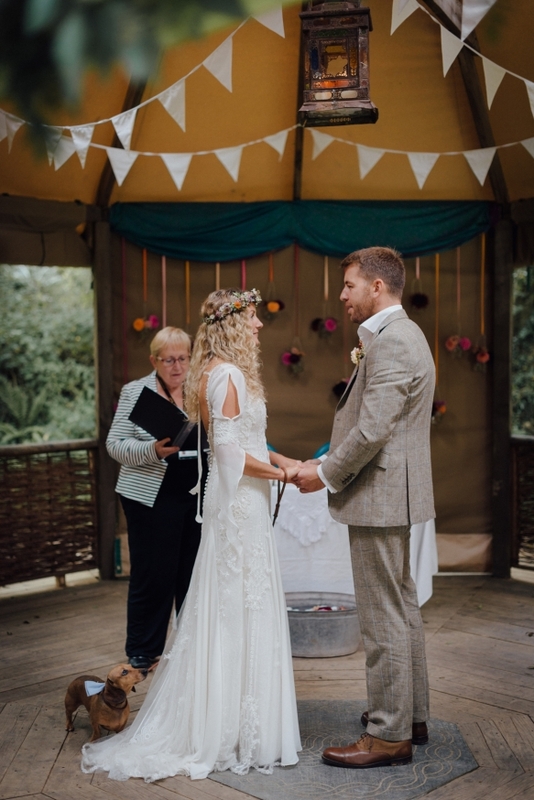 It was really important to us to get married outside surrounded by nature and close to the ocean so we were delighted when we found Cornish Tipi Weddings. We adore Cornwall and visit many times a year. 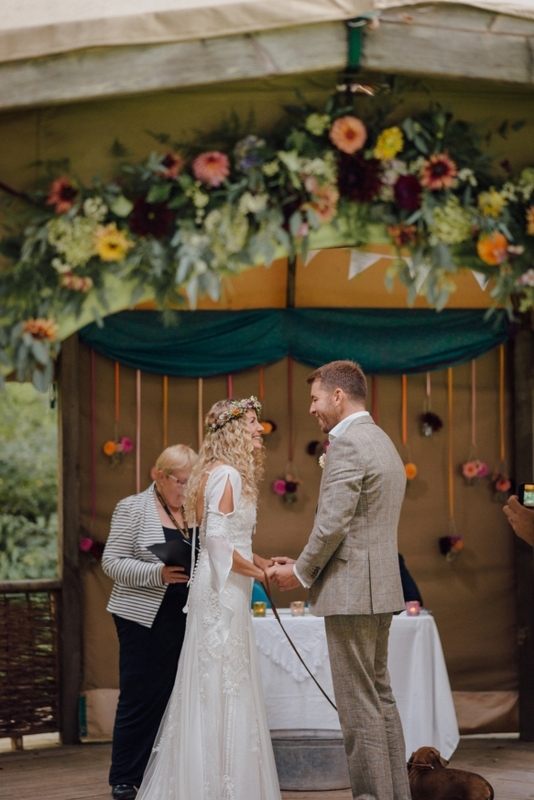 We were absolutely blown away by the magic of the venue – the beautiful outdoor pavilion where we would have our legal ceremony was just perfect, as were the tipis, and the lake was the most ideal setting. The day was really relaxed. I remember sitting outside in the rain making a flower crown for myself in the morning, then getting ready. I wore a beautiful bespoke dress, while John wore a Gresham Blake suit and our son wore a little waistcoat to match. 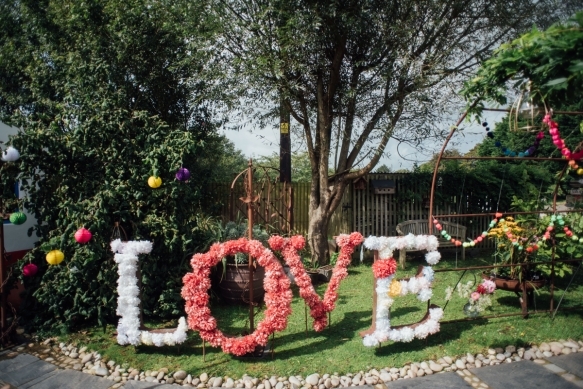 Although I planned to make my own bouquet, John wouldn’t hear of it! 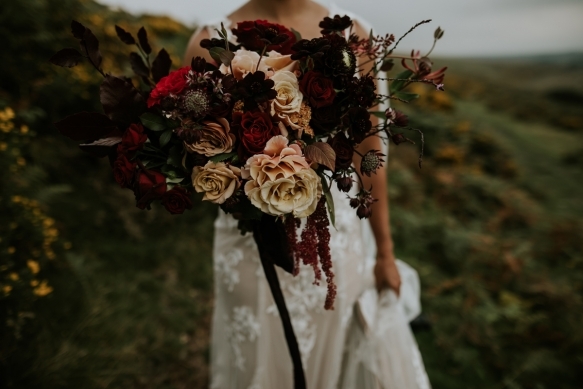 I adored my bouquet from The Garden Gate Flower Company, it was full of my favourite flowers. We rented a cottage close to the venue, and my dad turned up in a camper van he’d arranged as a surprise. I have fond memories of my dad and I singing and bopping away in the back of the camper down the Cornish windy roads on my way to get wed! 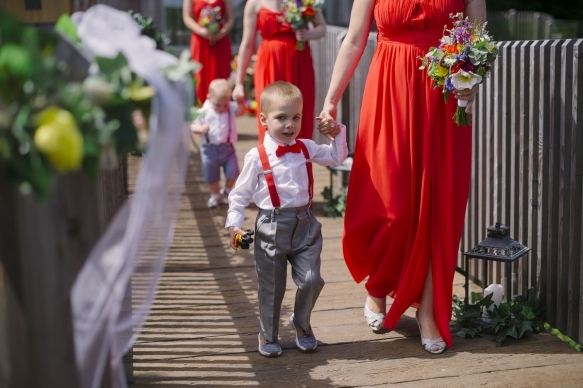 My dad and our flower girl walked me to the pavilion where John and our guests were waiting. Our music was playing and the candlelight was flickering, which picked up a little tear from John as I arrived. 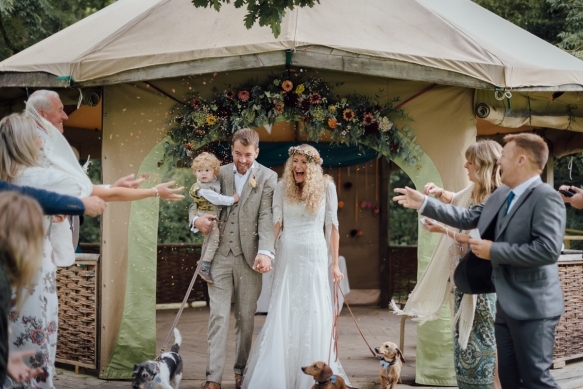 Our little boy and three dogs were a huge part of our ceremony, which was really important to us as it felt like our whole family got married! The celebrants were amazing and really picked up on our vibe. After the ceremony, we enjoyed a toast, canapés and a little boogie. We then headed off to the lake. 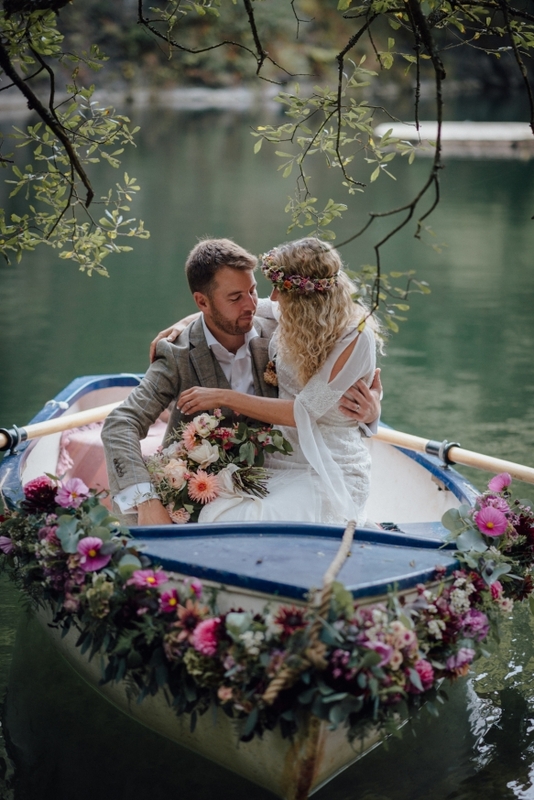 I had decorated one of the rowing boats and fulfilled my dream of sailing away with my love surrounded by flowers. We then headed off to Port Isaac for some coastal photos. 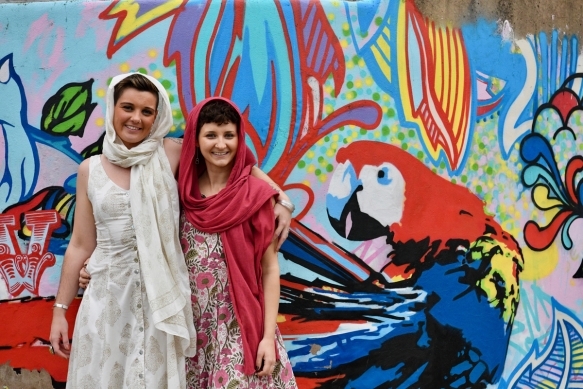 It was like a dream – lots of holiday-makers watched us hanging out and having our photos taken! 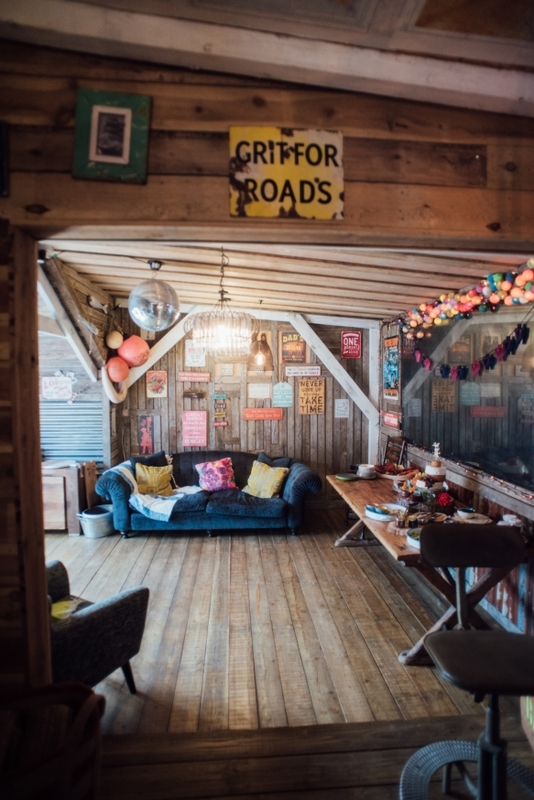 When we returned, we tucked into some delicious stone-baked pizzas with all our favourite toppings in the grand lodge tipi, which created just the right atmosphere for our informal feast. The food was absolutely perfect for us and the dessert was to die for. 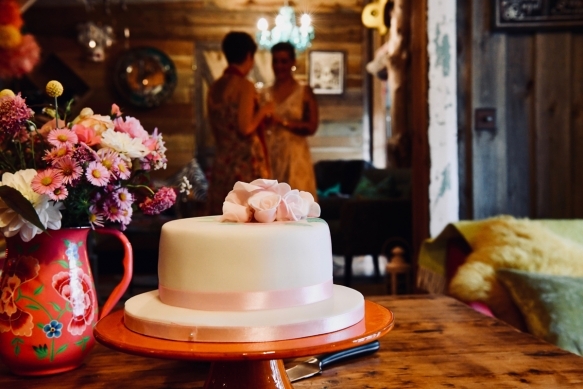 The frangipani wedding cake was decorated in fresh fruit and flowers and looked as stunning as it tasted. 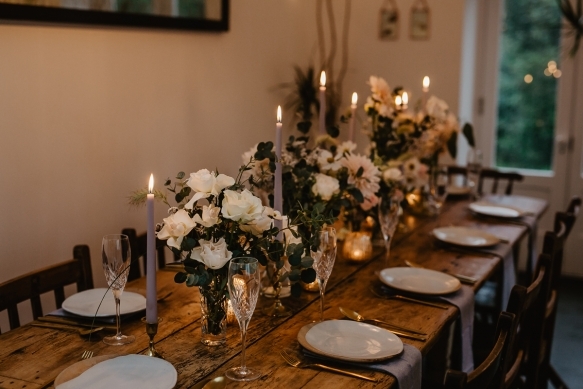 The venue supplied a sound system to play our favourite tunes and, with candlelight, champagne and scrummy food, it couldn’t have been more perfect. After we had cut the cake, we went down to a private tipi area and gathered around a campfire devouring cake. We lit sparklers as day turned to night and then went down to the lake and each lit a floating lantern. 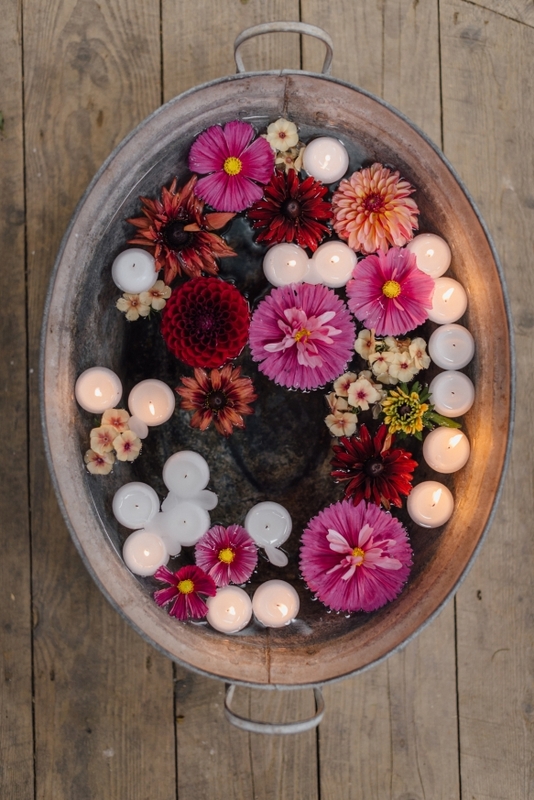 We asked our guests to light one with some positive intentions as we began our new journey together as husband and wife. John then rowed them out to the middle of the lake and released them. It was all just so magical. 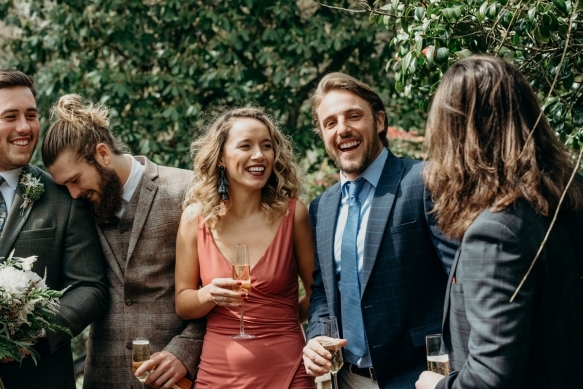 “We knew after attending plenty of friends’ weddings that it just wasn't our style to do a big, or even medium-sized traditional wedding. Being the centre of attention makes us both feel quite uncomfortable. 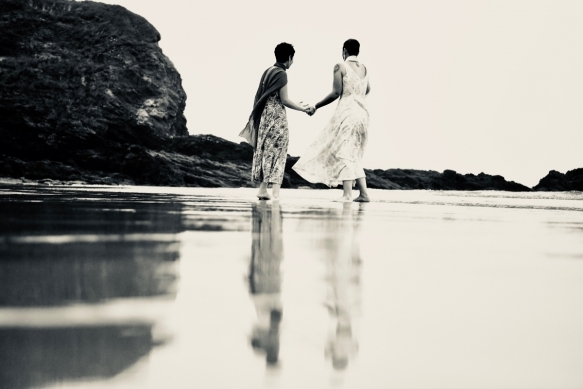 Another reason that influenced our choice is that neither of us has a large family, and our family members were very supportive of our decision to go to a faraway place and marry. We did have an ‘After Wedding Celebration’ party for 30 of our closest family and friends two months later. 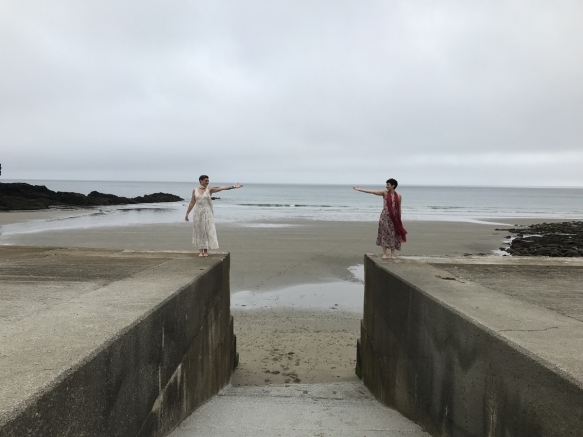 We were able to share our photos and wedding movie trailer with everyone – and I got to wear my gown again! We knew that we wanted to get married somewhere we've never been. 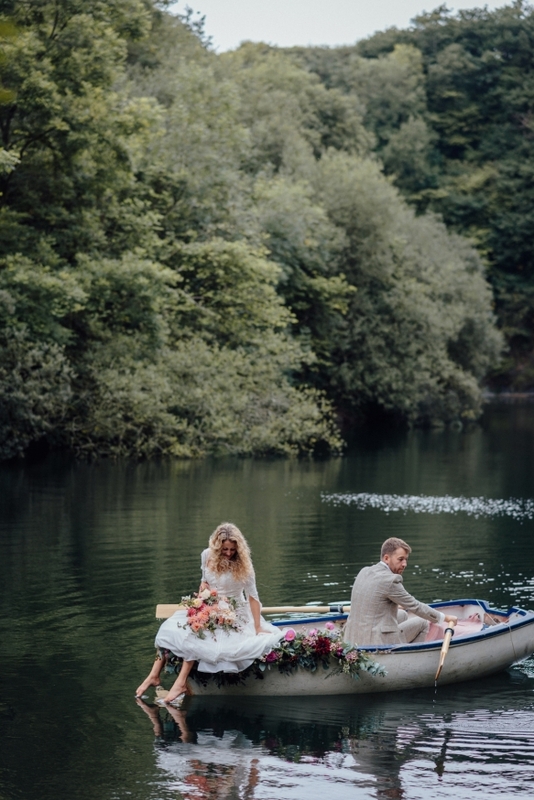 We've always enjoyed exploring new places, and knew we wanted to get married outside in nature. 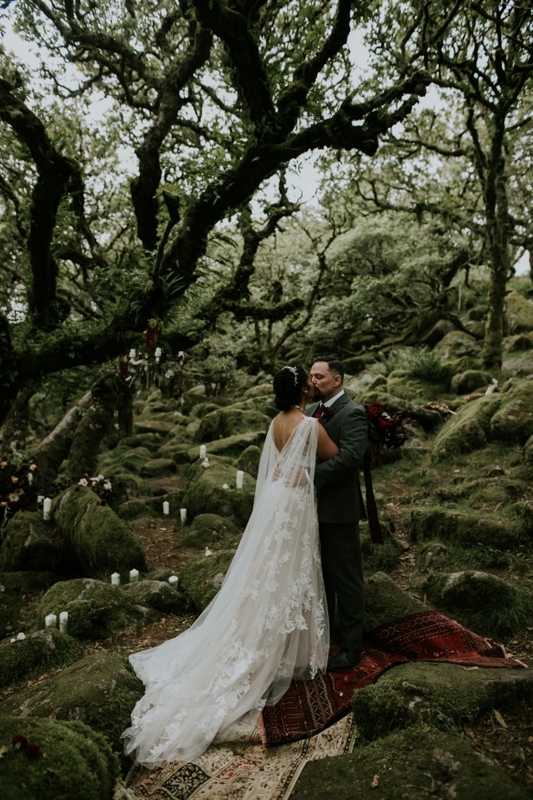 Eventually we agreed that a forest would be our venue. Eric had a very specific feeling about this forest he had in mind. I pulled up hundreds of images and showed them to him for approval. 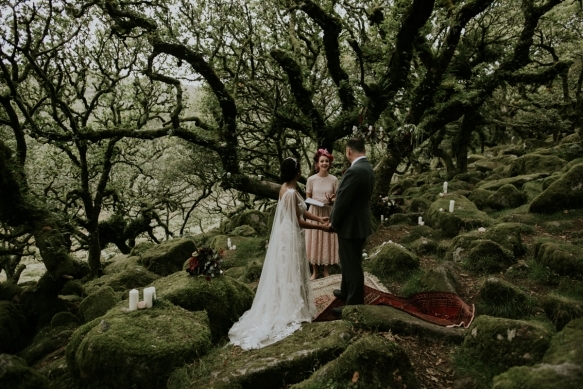 I searched for ‘moss covered forest’ and lo and behold, Wistman's Wood was the image that stood out to us. "Yes! Just like that forest!" was Eric's response. 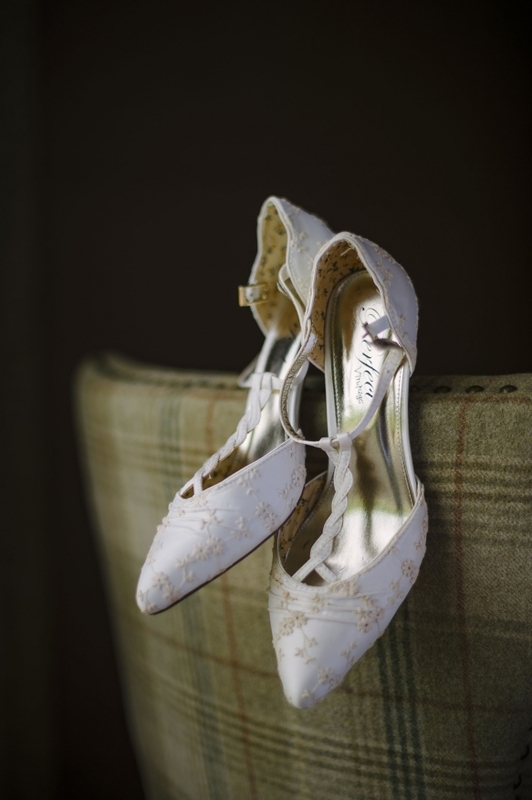 The day before our elopement, we met with our suppliers to discuss logistics and, that evening, Eric and I slept in different rooms at Glazebrook House Hotel. 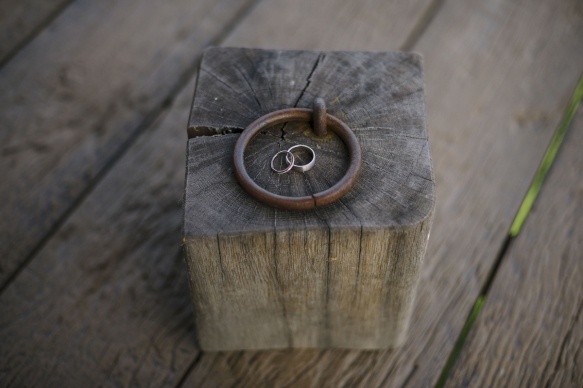 On our wedding day, we had breakfast together then exchanged gifts while we were getting ready separately. 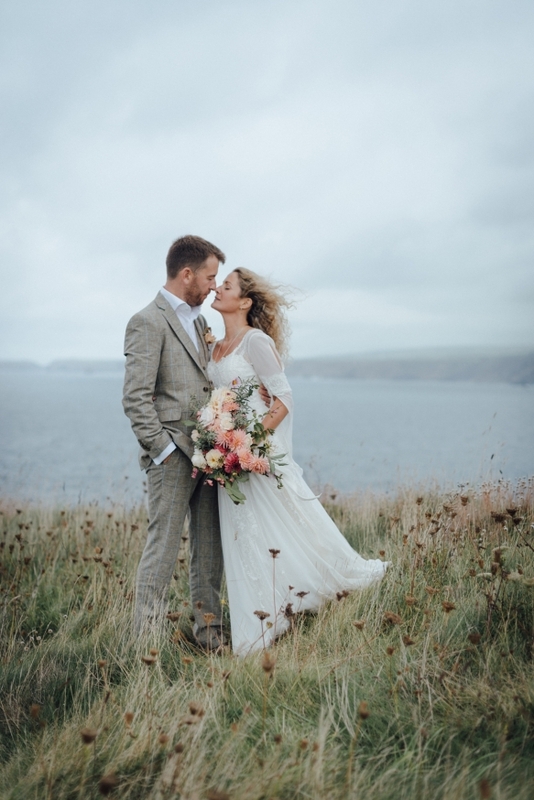 Eric wore a custom tailored tweed three-piece suit and I wore an Australian designer gown and custom-made cape. Then came the first look. I walked down a driveway under a canopy of trees where Eric waited with his back towards me. He turned around to see me dressed to be his wife. It brought tears to his eyes. I was smiling so much my cheeks were hurting. 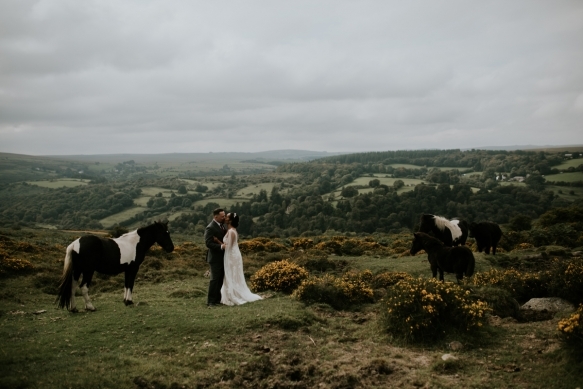 We then headed to Dartmoor, making photo stops along the way – one of our favourites being with the wild Dartmoor ponies. The scenery was amazing and the ponies were so close to us, it was such a fairytale scene. I had envisioned for years walking down the aisle towards Eric to ‘Wedding Song’ by Yeah Yeah Yeahs. It was playing while I carefully navigated the rocky terrain towards him. That moment was beautiful. It was uncanny that the song played in its entirety and ended exactly at the moment I stepped in front of him. It gave me chills seeing him standing there so handsome. It was extremely romantic. 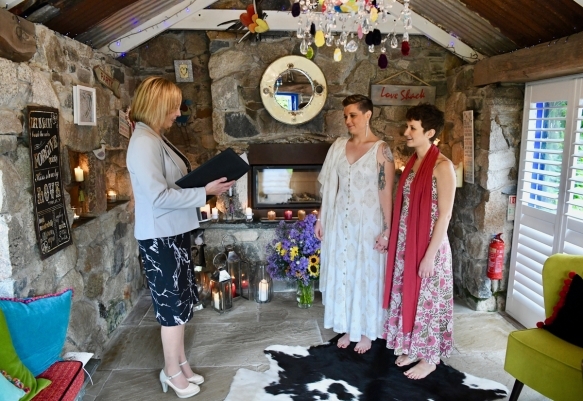 We proceeded with our ceremony, which included readings, our own vows, exchanging of our rings and a handfasting ceremony, then had the pleasant surprise of a pack of foxhounds running through the woods just above us. 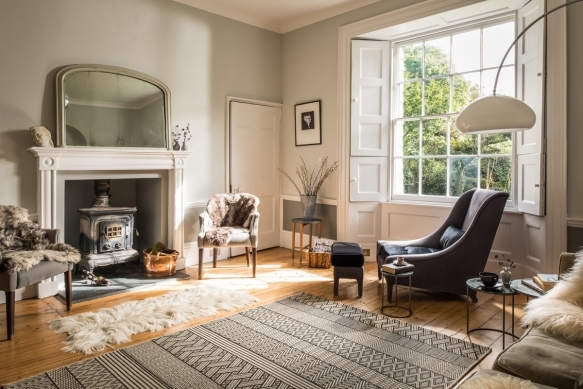 Props-wise, we kept it simple with two vintage rugs and a small white wooden chandelier. 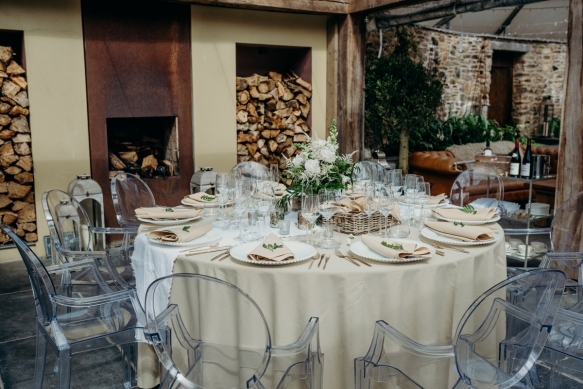 We then headed back to Glazebrook House Hotel where we enjoyed a delicious eight-course tasting menu and a small slice of wedding cake in a private dining room. 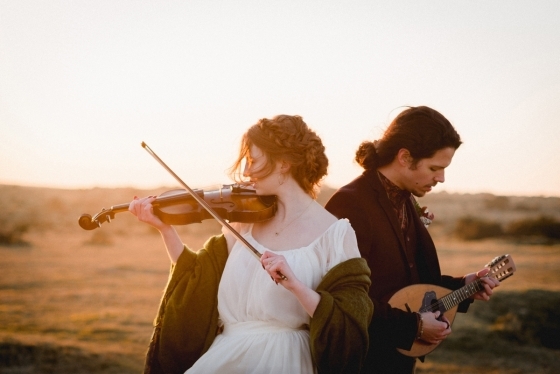 “We had been to a few elopement venues but Ever After was pure magic,” says Farren. “Just the driveway alone brought me to tears. 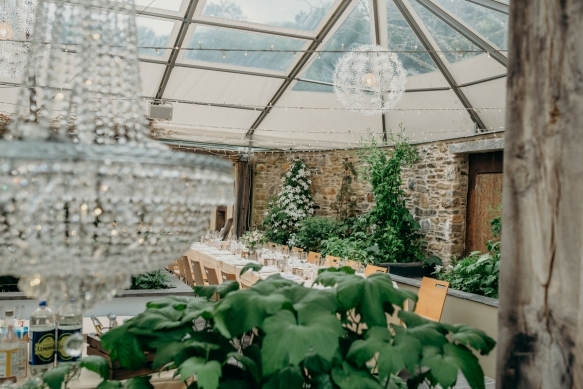 In addition to the venue being everything we wanted, the package and owner Nicola’s knowledge of wedding planning made everything seem easy and stress-free. Everything went seamlessly. The only small setback was that I left the vows on the kitchen table at home. 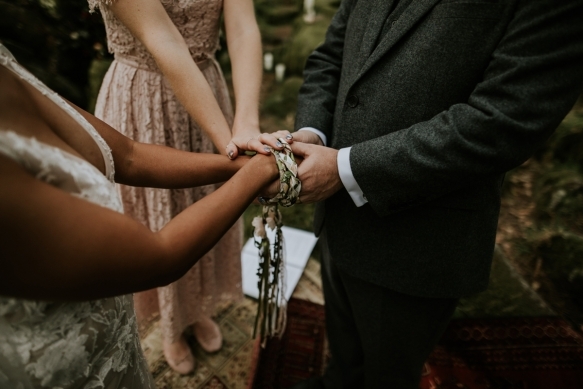 I was beyond stressed, but didn't have to worry because the wedding planner, Bethany, managed to get our vows to us before the start of the ceremony. 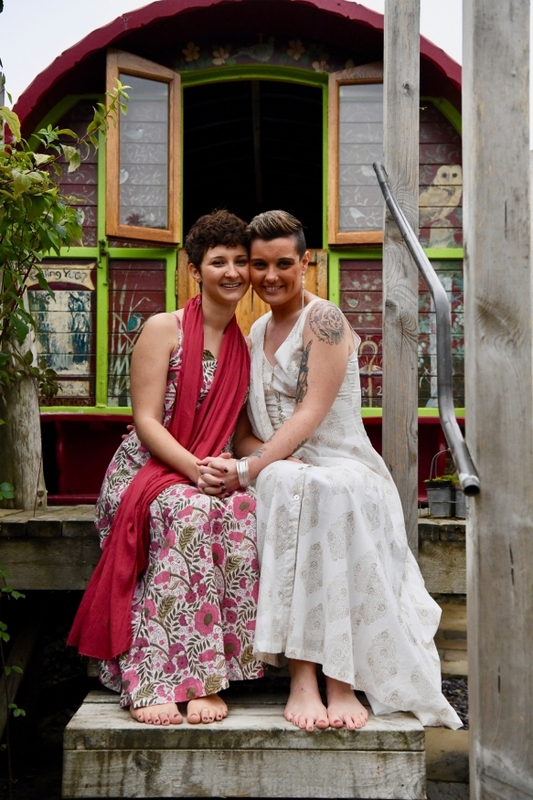 I was walked down the aisle by my best friend and I would not have changed that for the world. 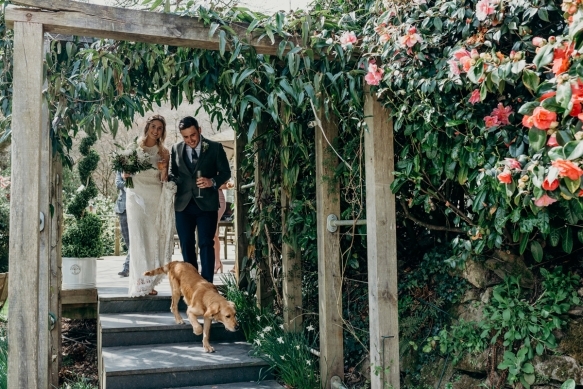 Everyone got very emotional and I don't remember a dry-eyed friend in the house – minus our dog, Memphis, who was not impressed that he was put on a lead for the ceremony! 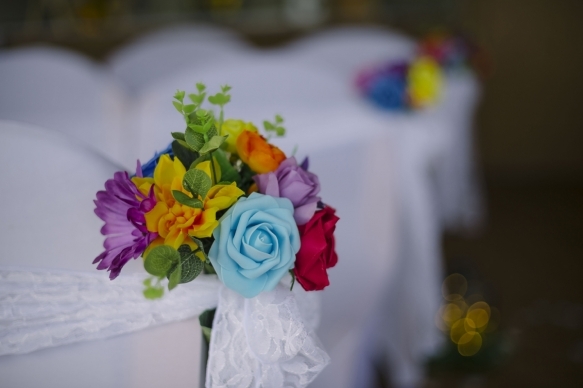 For outfits, everyone was given a loose colour scheme and the guests tried to match them. As for flowers and cake, the hours of Pinterest we went through was maddening, I think I looked at over 300 bouquets and 100 cakes! 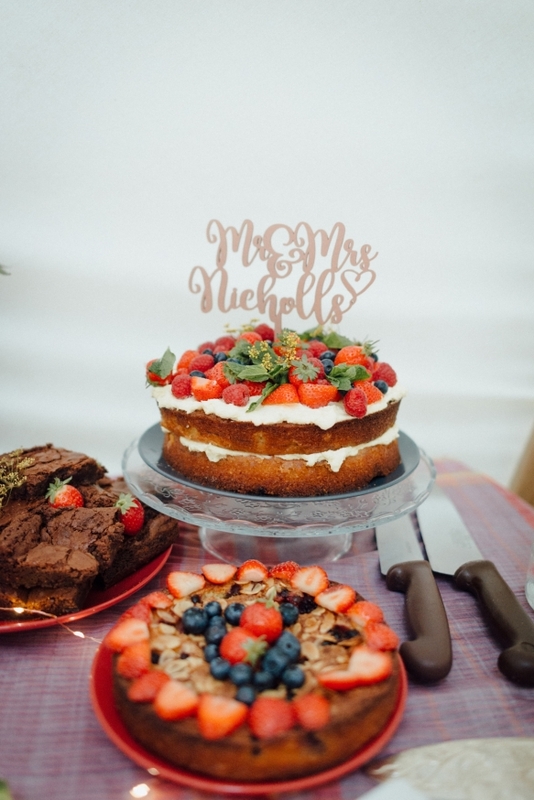 We then sent our top Pinterest ideas to Nicola's florist and chef and they did the rest – we did not have to worry about anything. 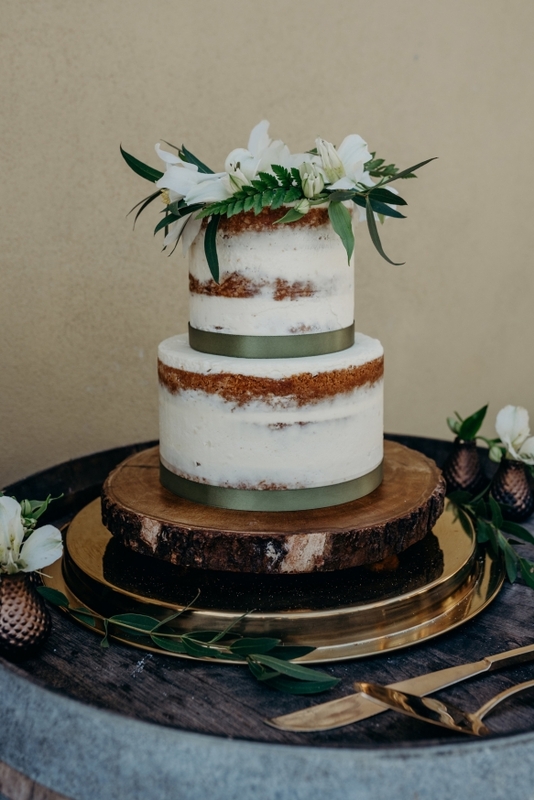 They created a seasonal elopement menu, so the food was stress-free as well, and the cake was the best cake I had ever had. 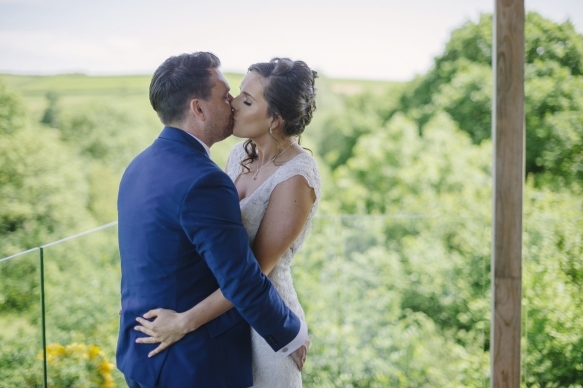 “We didn't initially set out to have an intimate wedding – we were looking at different wedding options when we found Treetop Escape and we both loved it, even though we visited on a really wet and windy day! There is nothing else like it around; it’s so unique and getting to stay for four nights was an added bonus; what’s more, it’s completely toddler-friendly for our little one. 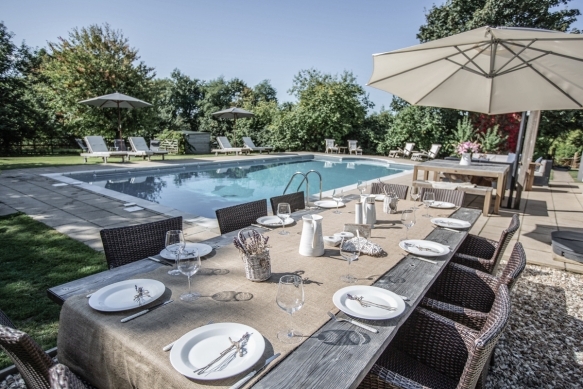 We woke up to the sun shining and enjoyed a relaxed breakfast outside, taking in the beautiful views. 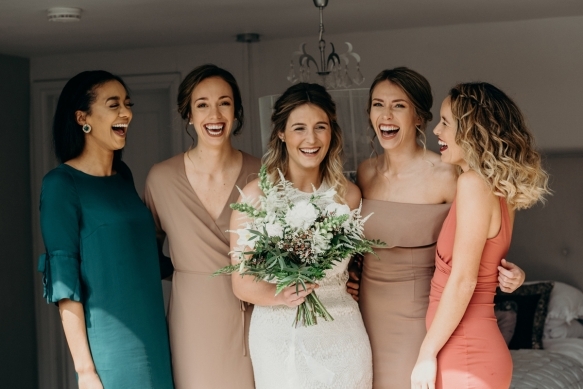 The hair and make-up artists came in the morning to get my three bridesmaids and I looking fab, then the florist dropped off the beautiful bouquets – they were an incredible team, decorating The Nest for the ceremony and then transforming it for fine dining afterwards. 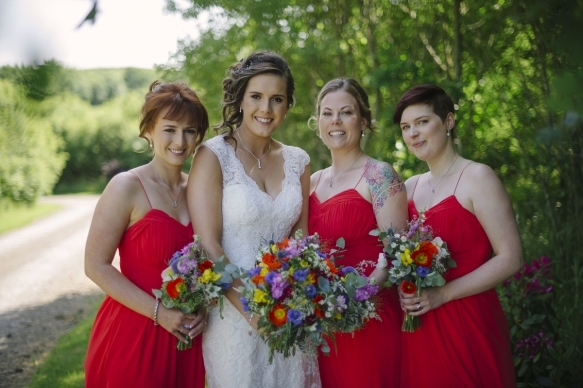 We opted for a vibrant colour scheme: red for the bridesmaids’ dresses and groom’s party accessories and sunny yellows, oranges and pinks for the flowers. 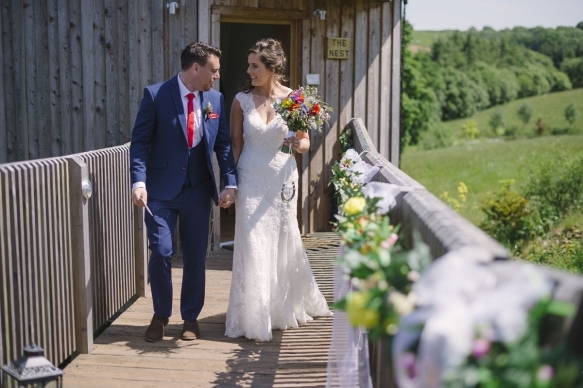 Decorated with flowers, the wooden walkway between the Tree House and The Nest made for a romantic aisle and we married before the glass balustrade, with miles of woodland as the backdrop. 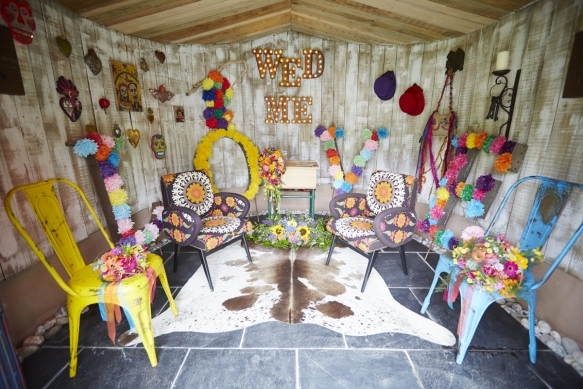 An ice cream van arrived for the day, and as a wedding gift we also had a surprise magician turn up to provide entertainment for all the guests and suppliers, which was brilliant – and the alpacas who live around the site were also loved by the guests! 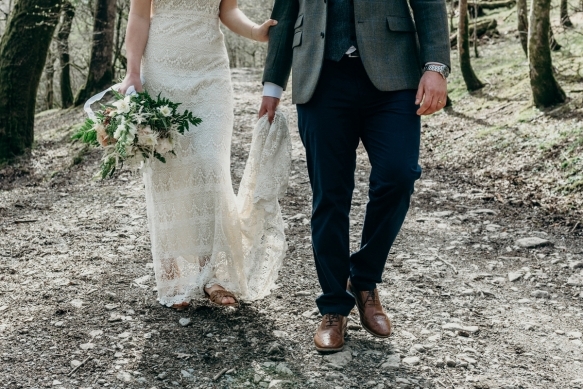 Living three hours away meant we hadn’t met any of the suppliers until the day, but the team at Tree Top Escape coordinated the day from beginning to end, which meant I was possibly the most relaxed bride ever! 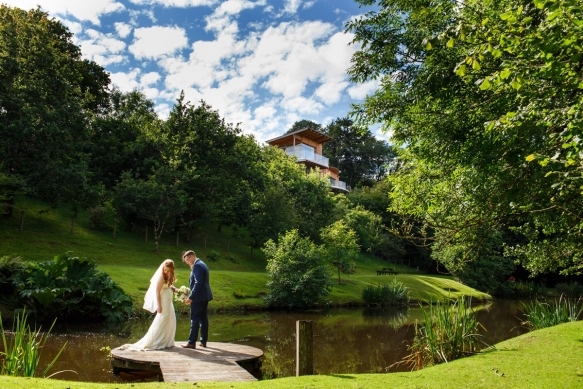 Located on a private estate in North Devon, Tree Top Escape is exclusive venue for intimate weddings with up to 14 guests to share your most special of days. 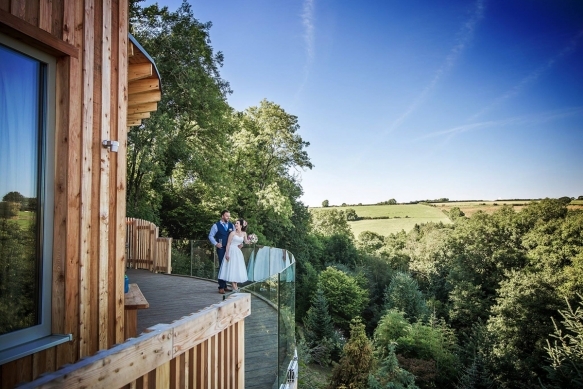 Simply walk across the romantic wooden walkway to enjoy your honeymoon at the luxurious Tree House, a spacious and indulgent property offering jaw-dropping floor-to-ceiling views of the valleys, with a large lounge, an Italian designer kitchen and even a freestanding copper bath. And if that’s not enough to persuade you, the private hot tub on the terrace will. 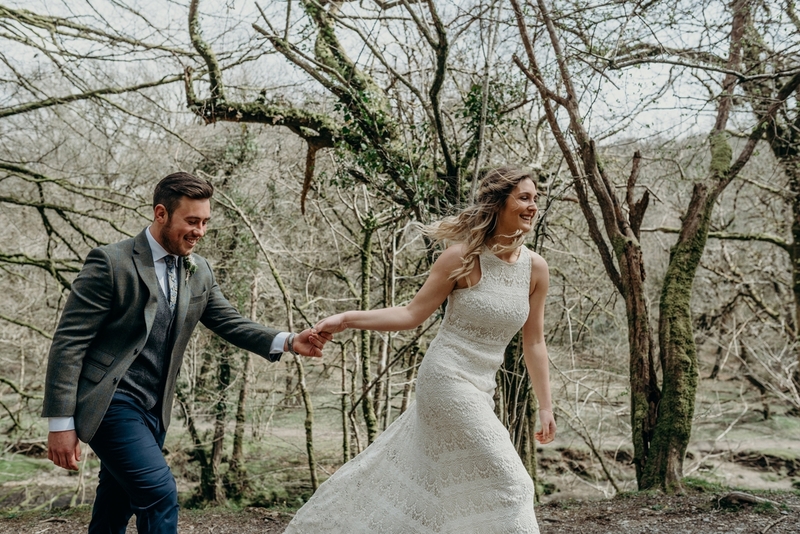 Tucked away in beautiful gardens and woodland on the edge of Dartmoor, Ever After at Lower Grenofen is an idyllic rural venue, offering special packages for gorgeous intimate celebrations. 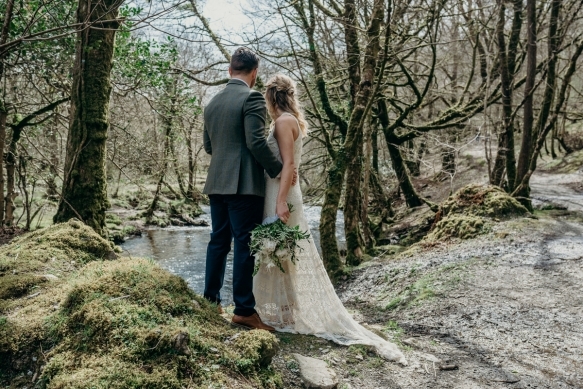 With a renowned wedding photographer on hand to capture every moment, flowers from an award-winning florist and a wedding breakfast served by a private chef, every detail will be taken of, leaving you to enjoy stress-free strolls through the woods, champagne toasts and a night of luxury in the honeymoon cottage. Wake to breakfast served on the private deck overlooking this heavenly corner of Devon. 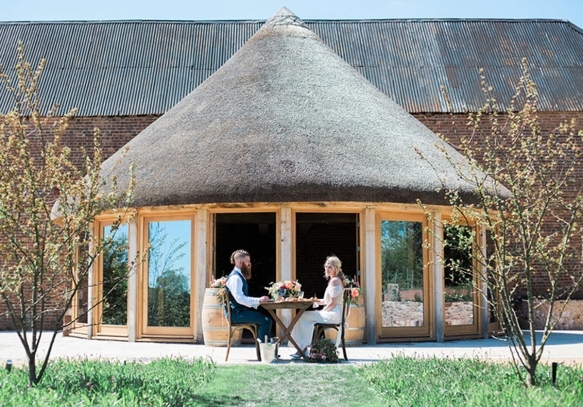 Nestled in the foothills of Haldon Hill, Brickhouse Vineyard – a renovated Grade II threshing barn and round house – looks out over gently rolling fields towards the coast at Teignmouth and, with the addition of a new landscaped terrace overlooking the vineyard, it makes the perfect venue for elopement, intimate and small weddings for up to 50 people. 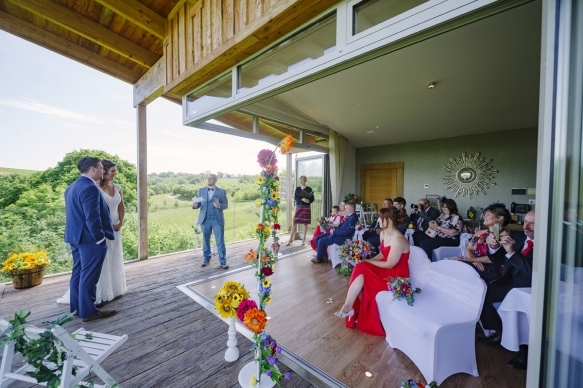 Arranging everything from witnesses to wine, Brickhouse Vineyard organises a bespoke package tailored to your wishes including flowers, photography and catering. 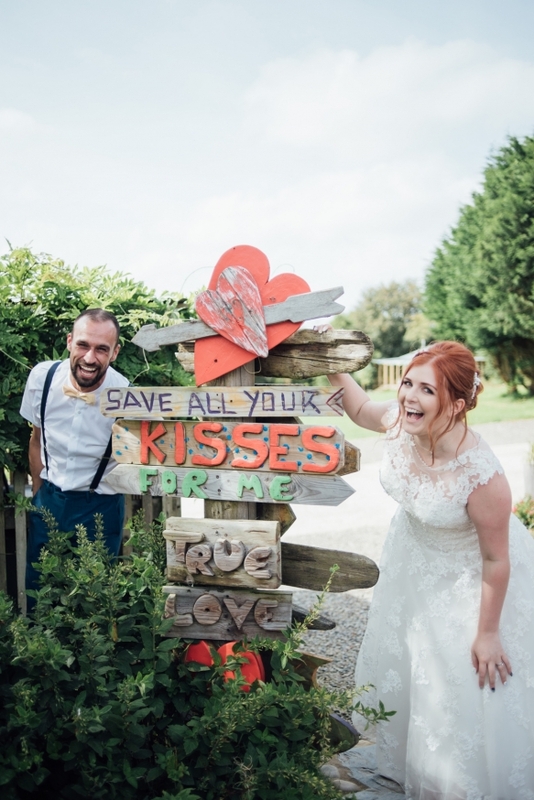 Full of colour and personality, Lower Barns is a brilliantly characterful elopement venue full of indulgent touches to bring a sense of occasion to your big – or little – day. 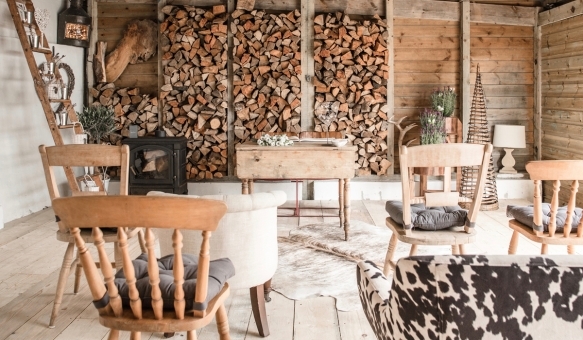 As luxurious as it is lovely, Lower Barns specialises in relaxed, intimate affairs of the highest calibre, with a host of features in place to ensure your every whim is satisfied in style, from bubbly on tap to a hot tub, sauna, gorgeous accommodation and a choice of atmospheric spaces to exchange vows. 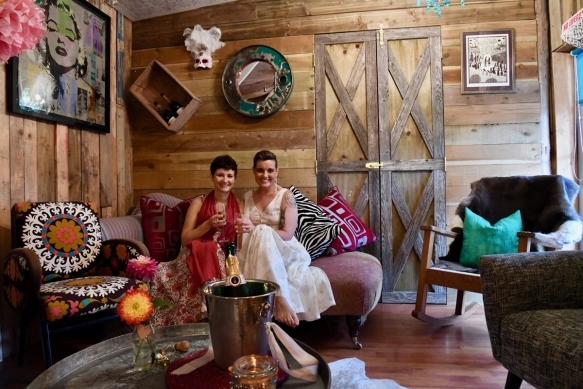 Stay in five-star suite Nook before walking down the purpose-built arbour, The Tunnel of Love, to utter your vows in The Wed Shed. 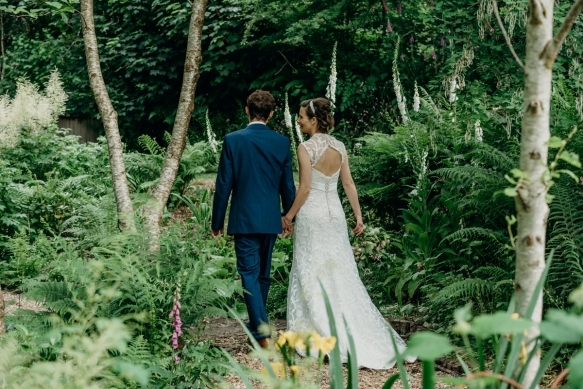 You can then enjoy a post-ceremony photo shoot in the garden or pop down to the nearby beach to celebrate that just-married feeling before heading to The Party Shed for the festivities – whether that involves feasting and dancing or snuggling up by the log burner. Nestled in the heart of the north Cornish countryside, a fitting location for an idyllic intimate wedding, Colan Barton has six beautiful areas in which to say “I do”. 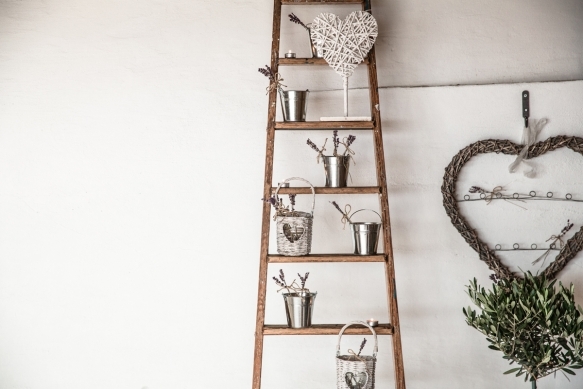 Whether that’s in front of an open fire in the lounge or dining room, in the gardens or even beside the swimming pool, there are picturesque indoor and outdoor options galore. 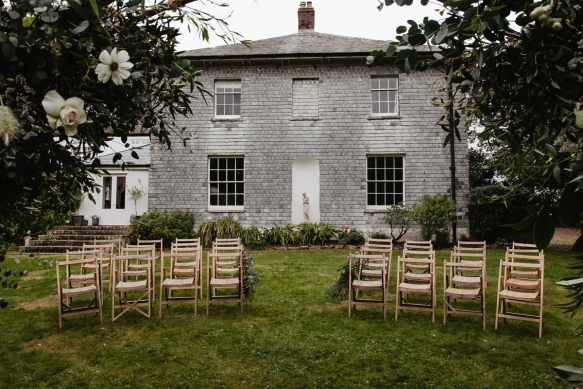 There’s even an historic Norman church next to the house if you’re after a more traditional setting. 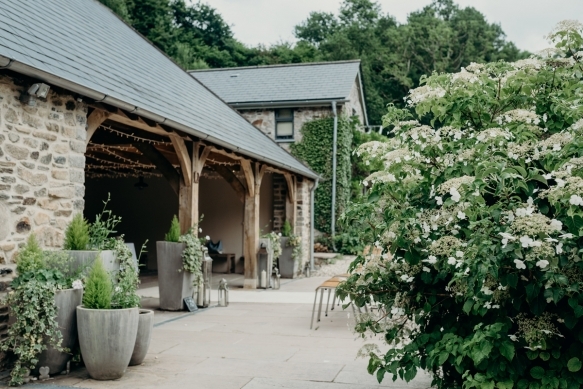 With the space and freedom to create your bespoke day, the Apple Barn venue and Grade II Colan Barton Estate sleeps up to 14 guests, and is enjoyed on an exclusive-use basis, meaning the grounds will be entirely yours to relish in. 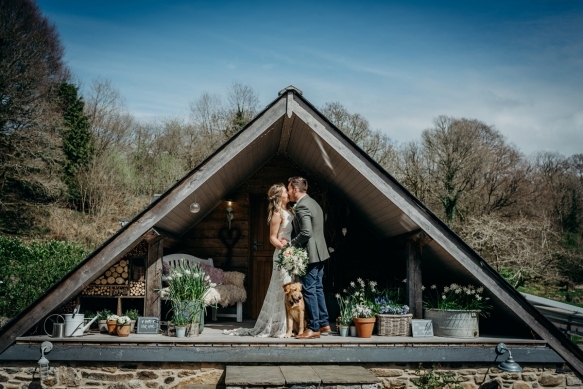 Make the most of the heated outdoor pool, cosy pool house, barbecue and hot tub – and don’t forget to toast your nuptials around the crackling firepit as you watch the sunset over distant views of Porth Beach. 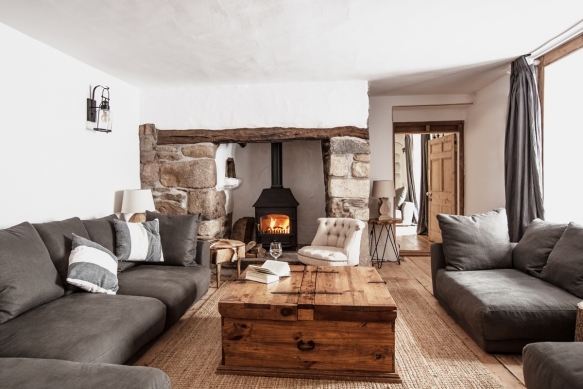 Described as a ‘homestead under the stars’, Treseren sits in a secluded position in the midst of Trewithen countryside, just 10 minutes from the spectacular north Cornish coast. 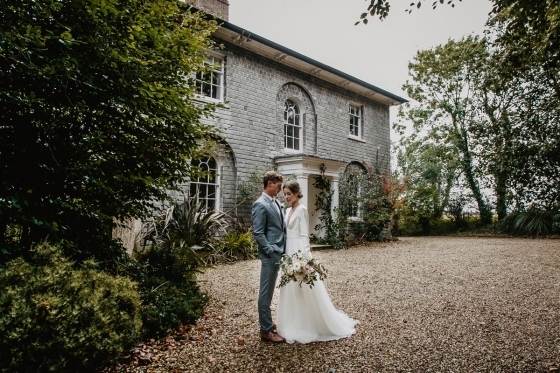 A new and elegant venue for intimate weddings with accommodation for 18 people, Treseren sits in two-and-a-half acres of grounds, with winding paths leading to secret flower-filled gardens. 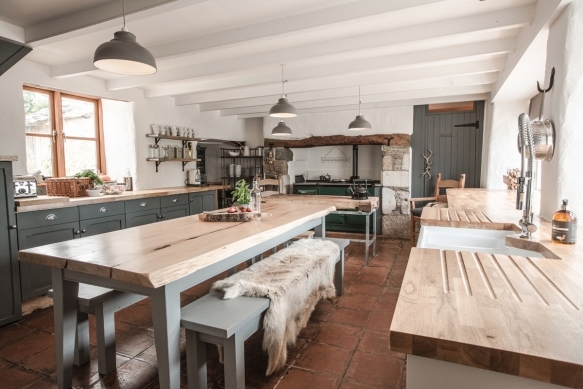 At the heart of the setting is Shepherds House, a Georgian beauty rich in historic atmosphere. 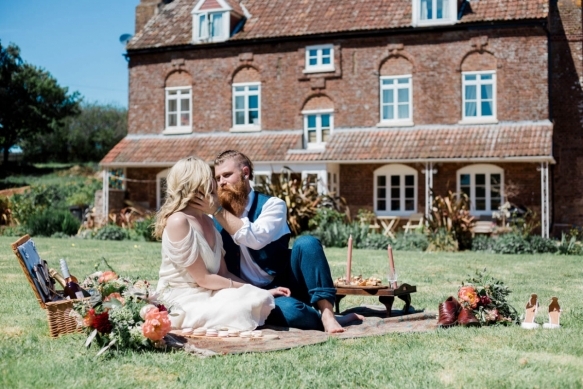 It’s a light, beautifully styled setting; the Drawing Room is particularly perfect for a candlelit winter elopement, with the wood burner warming the room, while the picture-perfect gardens offer a dream setting for a secluded al fresco ceremony with the house making for a striking backdrop. 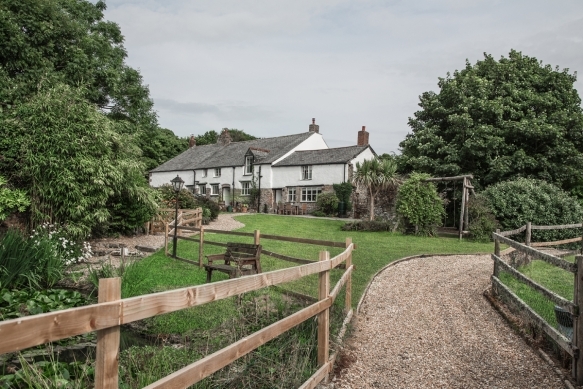 Adjoining Shepherds House, Sky Cottage offers a quaint, unique space with countryside views.